Always on the go? Our new Ardell Professional Deluxe packs has everything you need for gorgeous lashes in a flash! Ardell's best selling lashes are now available in a Deluxe Pack. Always on the go? 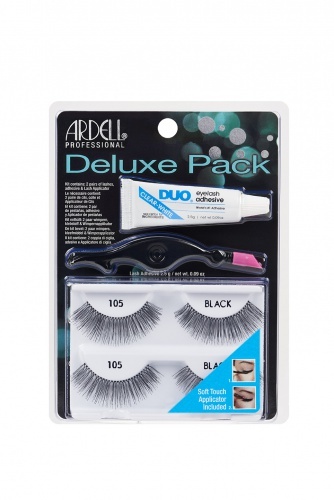 Our new Ardell Deluxe packs has everything you need for gorgeous lashes in a flash! Ardell's best selling lashes are now available in a Deluxe Pack. Please note Ardell Deluxe Pack #120 Demi Black is currently out of stock; Item will be available again shortly. try the same style in single pack Ardell Fashion Lashes #120 Demi. A girl can never have enough wispies with Ardell's Mini Wispies Lash Lookbook + Duo Glue. This complete all-in-one gift set includes 3 cult-favorite wispies styles: Demi Wispies, Wispies and Wispies #600. Includes Duo Lash Adhesive! Ardell Faux Mink Lash Lookbook 8 Pairs + Duo Glue Gift Set features a luxurious designer wardrobe of diva approved faux mink lashes! Please note Ardell Faux Mink Lash Lookbook 8 Pairs + Duo Glue Gift has been discontinued and is no longer available. Try the smaller sized gift set under Ardell Mini Faves Lash Lookbook + Duo Glue (Gift Set).